Fabian Ramirez (193-F-90) nailed 18 points to lead Regatas past Hebraica in Corrientes. Regatas accumulated a 47:29 halftime lead. Hebraica worked hard in the second half to come back into this one but Regatas protected the lead and raced to the victory. Santiago Vidal (180-PG-89, agency: Pro Sports) finished with 16 points for the winners. Leandro Garcia Morales (186-G-80, college: Texas A&M, agency: Pro Sports) answered with game-high 32 points for Hebraica. 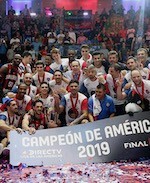 Estudiantes overcame Ponce to start their Liga Americas campaign. Clay Tucker (196-G-80, college: Wisc.-Milwaukee) posted 20 points to lead the Argentinean team. Estudiantes recorded a 25:12 lead ten minutes into the game. They went on a 43:30 second half run to ice the victory. Jasiel Rivero (204-C-93, agency: Pro Sports) had 15 points and 12 rebounds in the win. Angel Daniel Vassallo (198-G/F-86, college: Virginia Tech) answered with 15 points for Ponce.